Nigeria Security and Civil Defence Corps (NSCDC) in collaboration with CASIVA Nigeria Limited had promised to fight pipeline vandals to a standstill and end illegal oil business in that regard. 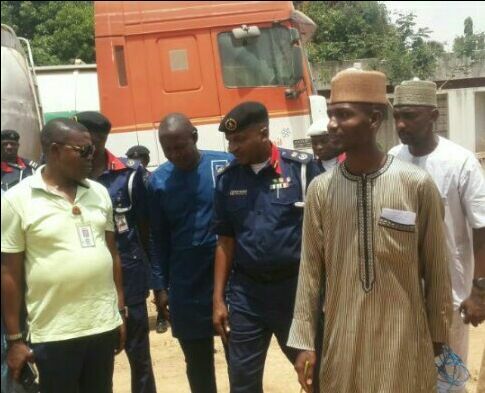 NSCDC Cmmandant in Kaduna, Alhaji Modu Bunu who said this on Friday while parading a truck load of 11,000 litres of Diesel intercepted from vandals who vandalized one of the pipelines in Keke village in Kaduna State disclosed that, a distress call was received from the Chief Security Officer (CSO) of the Casiva Nigeria limited, the company hired by the Nigerian National Petroleum Corporation (NNPC) who are saddled with the responsibility of monitoring and maintaining the pipelines on the vandals activities. According to him, upon the receipt of the distress call, the Anti vandal unit of the Corps swung into action and swiftly stormed the area but succeeded in apprehending only the truck as the vandals took to their heels before their arrival. He disclosed however that the men of the Anti vandals are still on the trail of the vandals and assured of their apprehension any time soon. Meanwhile, he called on all those who takes vandalism as their business to have a rethink and consider another legitimate business, stressing that, “we will ensure that we chase them out of business. “We are committed to collaborating with relevant stakeholders towards making sure that the activities of vandals in the state and Nigeria at large is brought to a halt”. Earlier, the CSO of Casiva Nigeria Limited, Captain Ali Mohammed (Retd) disclosed that on the 9th of April, 2017, some vandals stormed keke village Zaria road ‎with a red golf car and shot severally to the air scaring people away at about 2am. He said, the attention of the men of the NSCDC was called immediately and the anti vandal squad responded swiftly and apprehended the truck which already had 11,000 litres of AGO in it.